The Museo Civico Archeologico also includes Egyptian religious statues of the Roman period. ﻿ ﻿ Turreted boundary walls and gates maintain the medieval aspect of the elegant, charming town of Treia perched high on a hill, untouched by mass tourism. 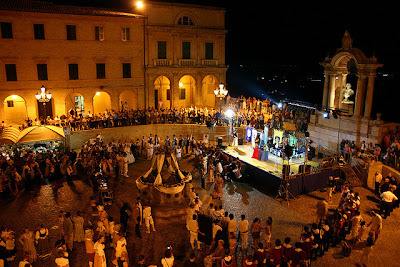 For its beautifully preserved historical center it is included among the Borghi più belli d'Italia. In July we saw posters around the town for ‘Disfida del Bracciale’. 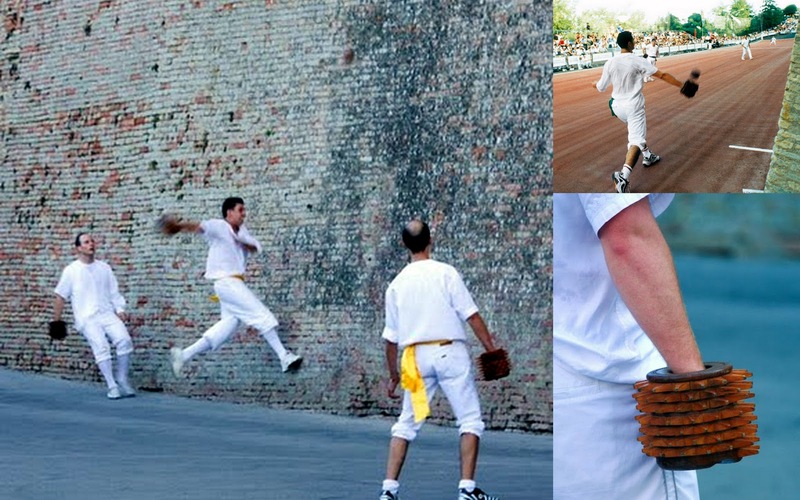 Our friend Stefano explained that Treia is famous for hosting a traditional ball game dating from Renaissance times called The Challenge of the Armlet (also known as Pallone col bracciale). ﻿﻿He said that it was similar to tennis but instead of racquets, the players use a device called a ‘bracciale’- a sort of wooden cylindrical spiked glove worn over the hand and forearm. A hard leather ball is pounded back and forth between two teams of three, with a high wall (between 14 and 20m) on one side, permitting deflection back into the field of play. The court is very long - around 90m. Scores are the same as in tennis – 15, 30, 40, game – and the first team to win six games is the victor. The Challenge is preceded by costume processions and ceremonies, evoking the times of Carlo Didimi, the greatest player of pallone. Each year the challenge is held on the first Sunday of August, following ten days of festivities that start on the Friday before the second last Sunday in July. This unique festival ends with a magnificent fireworks display. • Ciauscolo - a delectable, spreadable salami. • Porchetta with grilled polenta. • Coniglio alla cacciatora (rabbit stew hunter-style). • Scroccafusi (Castagnole marchigiane) – a pastry of flour, eggs, sugar, aniseed and lemon zest. • Cicerchiata - balls of fried sweet dough joined into ring shapes by warm honey. ﻿ ﻿Treia is also an ideal place from which to explore other towns in Italy, with Perugia, Bologna, Florence, Assisi, Pescara, Siena and Rome all day-trip possibilities. 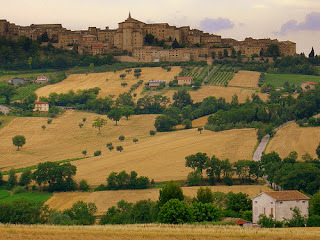 Closer still are the university town of Macerata, just a 15 minute drive away and the Thermal Baths in Tolentino, just 18km (11 miles) to the south. I would recommend hiring a car for getting around this area as it is not served by railway and buses are infrequent, but this ensures its tranquillity. Thank you very much for revelation of one more beautiful hill-town in Le Marche. It looks splendid indeed. And I’d like to taste the “calcione”. I’ll share your charming post with Facebook and Twitter. Grazie mille Tatiana! I look forward to discovering more hill towns in Le Marche and Abruzzo with you in August.